I get this type of question a lot. Usually from kids who have come from gymnastics with mostly bodyweight training who are transitioning to the gym and need some guidance. I have a couple of links to lots of information on the sidebar THIS IS GOOD and for diet SO IS THIS. Well, it’s pretty easy as a process so let’s have a look. Set a goal. What is it you want to do? I will assume that you know endless cardio is damaging to your system and so please spend no more than 20 minutes at a time on the cardio machines otherwise you will flood your system with stress hormones and kill your hard work. That said, a 10 minute warmup is ideal before weights then a 20 minutes higher intensity stairmaster or stepmill session is best. Split your workout into 3 or 4 days so you can start to become regular with your work. I recommend at least 4 days a week in the gym so you don’t spend all your time sore from resting too much. Every split should have one day as leg day and then usually a push day for chest and triceps a pull day for back and biceps and an extra day for shoulders and core. You don’t have to know how to do a thousand exercises to make this work, start basic and then transition as you go. No matter if you are a 15 year old girl or a 25 year old guy there are certain exercises that you should do no matter what. Among these are squat, bench, overhead press, curls, dips and deadlift. 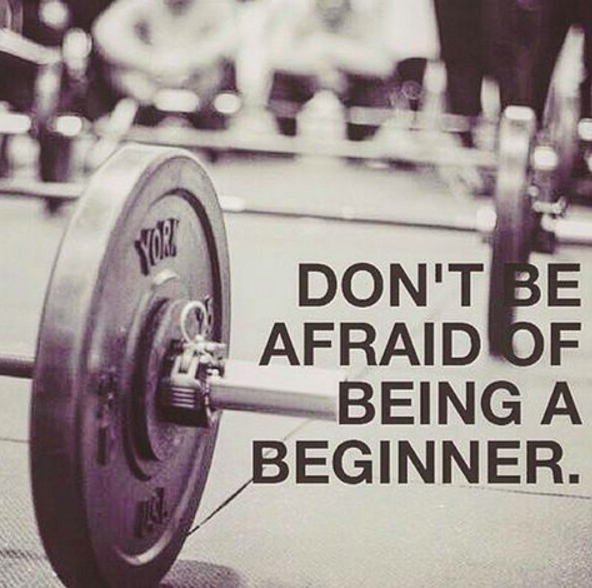 Don’t get freaked out by the deadlift, it is just picking stuff up and putting it down. So lets take a quick look at the work to be done as a beginner just starting out. This will last you about a month until you start wanting to do more varied exercises by which time you will have picked up some tips from watching others and will be able to add things to your routines. Every set will be done to 12 reps with the last 2 reps being difficult to finish. Once they aren’t difficult, increase the weight. Don’t worry about getting bulky, that takes a major commitment on the eating side of things to happen and if it really was that easy, everyone would be a bodybuilder. This should be enough to get you started and comfortable in the gym. Remember that your gym time is an investment in your health not in your relationships so focus on your work and save the chatter and socializing for afterwards. This entry was posted on Wednesday, April 18th, 2018 at 8:10 AM	and is filed under Gym / Weighlifting Workouts. You can follow any responses to this entry through the RSS 2.0 feed. You can leave a response, or trackback from your own site.